This past Sunday a bunch of my friends and family went on our fifth Mystery Day Trip! What’s a Mystery Day Trip? Well, I’ll explain (if you already know, you can skip this part and go straight to the main event). In the morning you get together with a bunch of friends and family. Everyone brings a day trip itinerary: a small handful of things to do during the course of a day. Generally there are some restrictions, like the whole day can’t cost more than $20 per person, or your destination can’t be more than a two-hour drive away from your starting point, the whole trip can’t take more than about nine hours. Y’know, stuff like that. All the itineraries get put in a hat or bag or whatevs, then someone (preferably a cute kid) draws an itinerary from the bag, and that’s the one that gets done that day! “Circle in the Sound” — Taking the ferry from Seattle to Bainbridge Island, then driving back to Tacoma down the peninsula, exploring on the way. Exploring the Issaquah area, including Cougar Mountain Zoo and Boehm’s Candy Factory! Of those four trips, THREE of them were designed by either me or Carrie. So we didn’t bring any itineraries this time; we like to let someone else have the glory now and then. We met at Bluebeard Coffee at 10:00(ish) AM and randomly chose an itinerary. Mystery Day Trip #5 was a bit different than the others: it was an in-town day trip! 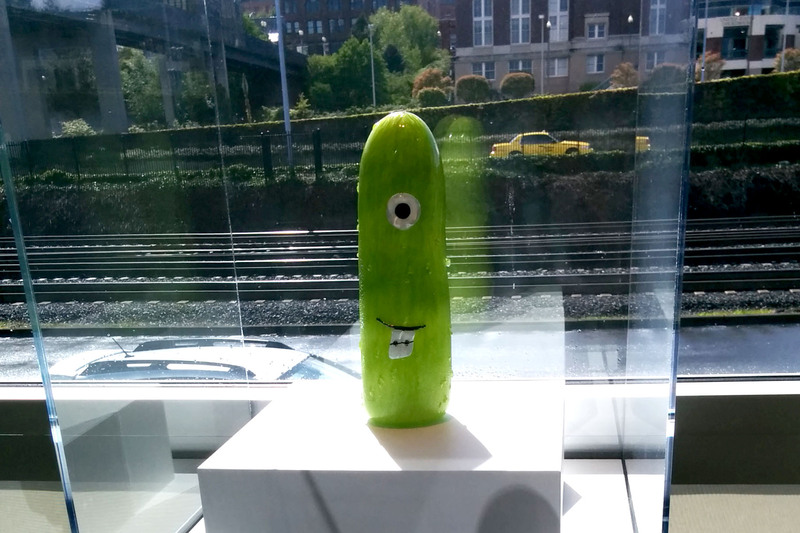 Mystery Day Trip #5: Artsy Tacoma! Stop #1: WW Seymour Botanical Conservatory at Wright Park! The WW Seymour Botanical Conservatory is a lovely (though small) arboretum in Wright Park in the Stadium District of Tacoma (just west of Downtown). This day they were actually having a very cool exhibit. Local schoolkids had designed animals that were then created in blown glass and distributed among the foliage! Wayzgoose is an annual gathering of printmakers that happens at King’s Books in Tacoma, kinda right between Stadium District and Downtown. Why is it called Wayzgoose? It’s some old-timey word. Anyway, there were printmakers galore, selling their prints and also having fun little activities where kids could make their own simple prints in a variety of simple ways. A couple of really cool prints came out from under that steamroller. One was of the old, defunct Never Never Land amusement park that used to be in Tacoma, and the other was of a giant octopus (and was labeled, helpfully, “Giant Octopus”). By the way, the Never Never Land amusement park is a fascinating story in its own right, but not one for right now. You can see what happened to a bunch of the figures that used to be in the park, though. It’s kinda creepy. The inside of King’s Books was a bit of a madhouse. It was P-P-P-PACKED. Especially packed was a line for the Beautiful Angle poster makers. Apparently you could make your own Beautiful Angle poster or something? I dunno, we had a bunch of kids with us so none of us felt like waiting in a line like that. Also, Carrie ran into about fifty people that she knew. Freighthouse Square is an old freight house (of all things) near the Tacoma Dome that was transformed a long time ago into a kind of shopping mall. I guess it’s kinda like a very small (and much lower-rent) version of Pike’s Place in Seattle, but without all the food & produce vendors. We didn’t go there to shop; we went there because there’s free, unlimited parking in the parking garage, and there is a food court where we at our lunches (though most of us packed our own picnic lunches). Stop #4: The Museum of Glass! I’ve lived in Tacoma for almost 15 years. That’s longer than there has been a Museum of Glass, and yet I’d never been there before (except for a friend’s wedding reception that was held there, but that doesn’t count). Once you get off the light rail Downtown, you have to walk over Highway 705 across the famed Bridge of Glass (above) to get to the museum. The Museum of Glass isn’t just static museum; it’s a working museum. That big, weird, cone-shaped structure on the south end of the building is actually a functioning chimney. Inside is a real-life hot shop where real-life glassmakers ply their craft. There are stadium-riser seats you can sit in and watch these crafstpeople at work, and a “narrator” of sorts tells you what’s going on and answers questions. This day they were making big (12″) glass balls in Seahawks colors for some sort of corporate gift. It was very interesting to watch, especially when of the people had a spare minute and decided to make a glass horse. Just because. This was a very interesting Mystery Day Trip in that it wasn’t so much a trip as it was just a tooling around town. But still, we did a bunch of things in our own backyard that we’d never actually done before. I’d never been to Wayzgoose or the Glass Museum before. But now I have. Thanks to Mystery Day Trip! They’re really fun. All y’all should plan your own Mystery Day Trips. Or let me know if you want in on our next one. You never know where you’ll end up! Tags: Bridge of Glass, Freighthouse Square, instagram, King's Books, Museum of Glass, Mystery Day Trip, Tacoma Link Light Rail, Wayzgoose, Wright Park, WW Seymour Conservatory. My New Nephew is Stone Cold! 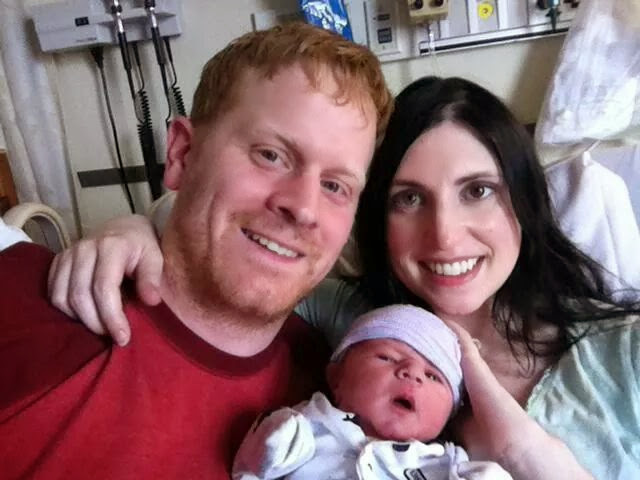 Born yesterday 4/23/14 in the wee hours of the morning, here is my brand-new, stone-cold nephew Austin! Yes, another “A” name kiddo in the family! So now my wee beb Avery has TWO cousins within spittin’ distance of her age. This should be fun. Is it just me, or does Austin look pretty much exactly how his brother looked in his birth photo? 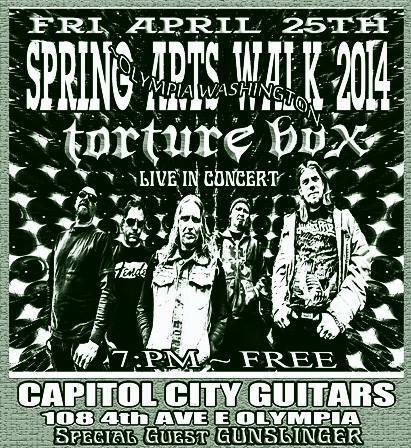 2 Chances to See Some Metal Guns Get Slung: Gunslinger in Olympia This Weekend! 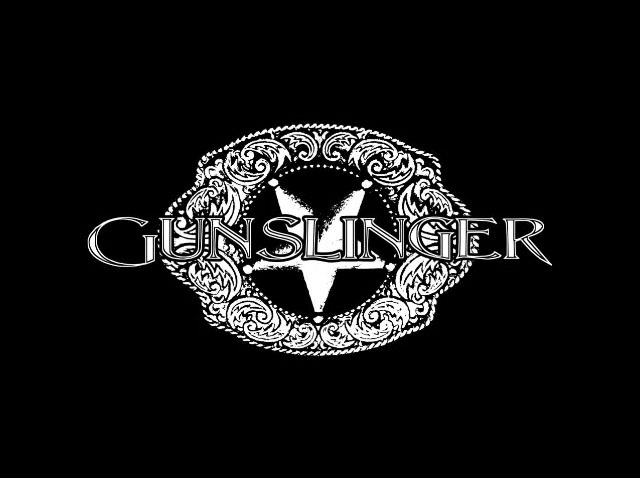 Gunslinger: Slinging some nerdy metal guns. 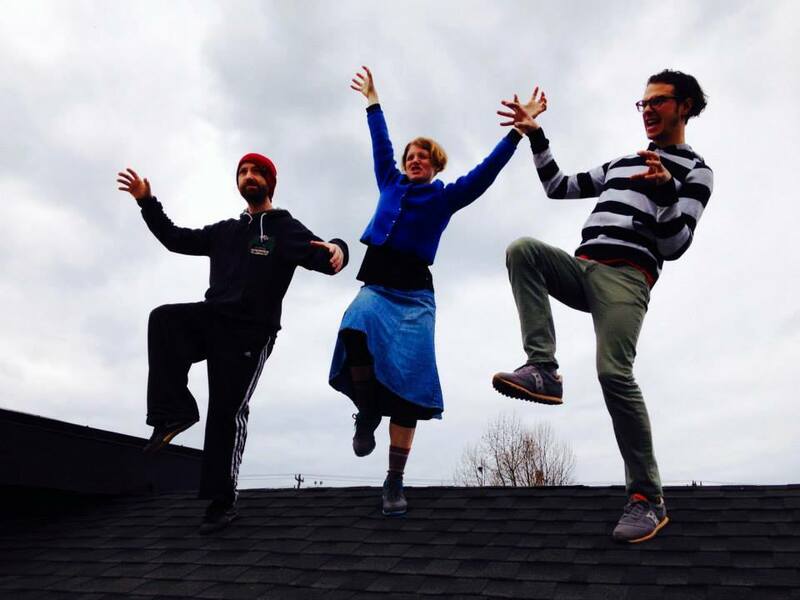 Olympia Artswalk is this weekend, and there’s some nerdy Heavy Metal opportunities for YOU! 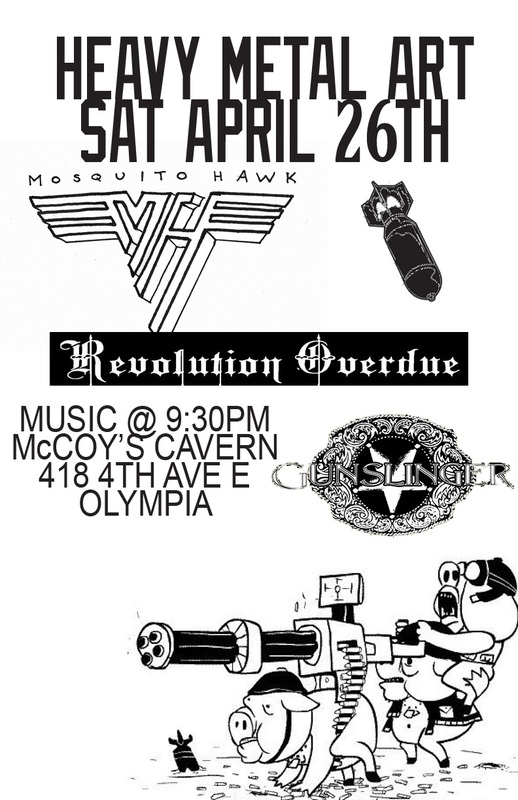 That’s right, Oly’s own Gunslinger is playing shows on both Friday and Saturday night! We are Gunslinger. A particularly lethal combination of beer, science fiction and METAL! I’d love to be able to see these shows, but with the wee beb who knows if I’ll be able to? But that shouldn’t stop you! Gunslinger Show #1: Olympia Artswalk! Gunglinger Show #2: McCoy’s Tavern! Will I see you there? Well, that depends on if I can make it to one of the shows or not! We’ll see! Tags: Capitol City Guitars, Gunslinger, McCoy's Tavern, Olympia. Good Ol’ Terry ‘n’ Bruce. 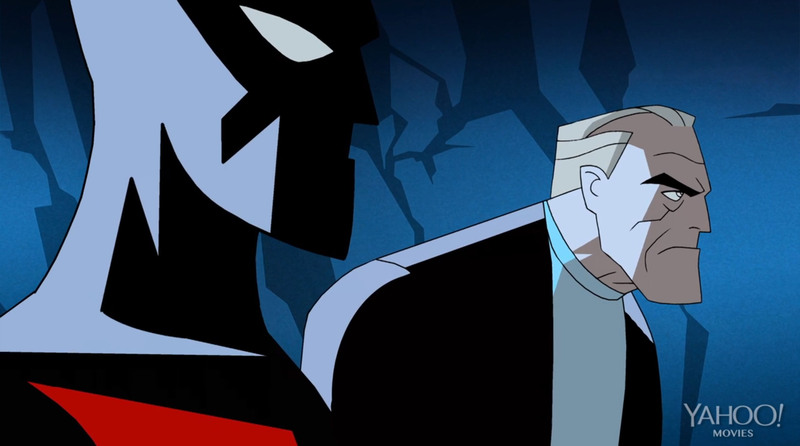 As sort of a follow-up to last week’s post (“The Bruce Timm Batman is Back… Kinda”), here is another video that was just released in celebration of Batman’s 75th Anniversary. This one isn’t quite as successful I think as Bruce Timm’s short, but mostly because of the much-shorter running time. The story feels compressed and rushed; edits are too fast and the pacing is kinda jumbled. It’s almost more like it’s a trailer than an actual short. 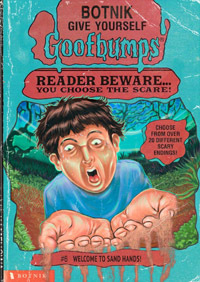 That said, it’s a clever (if un-resolved) little short, and the pan at the end is pretty epic. Can you name them all? My pal Open Mike Eagle is gearing up to release a new album! Yusss! Hoo-Ray! It is to be called Dark Comedy, and it is most likely to be extremexly awexxxome if what I’ve heard from him lately is any indication. 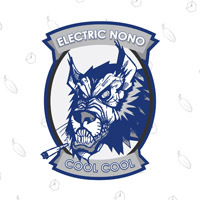 He has just released a preview track from Dark Comedy, the aptly-titled “Dark Comedy Morning Show.” You can stream it here! DO IT! NOW! The album doesn’t drop until June 10th, but if you really can’t wait that long you don’t have to! 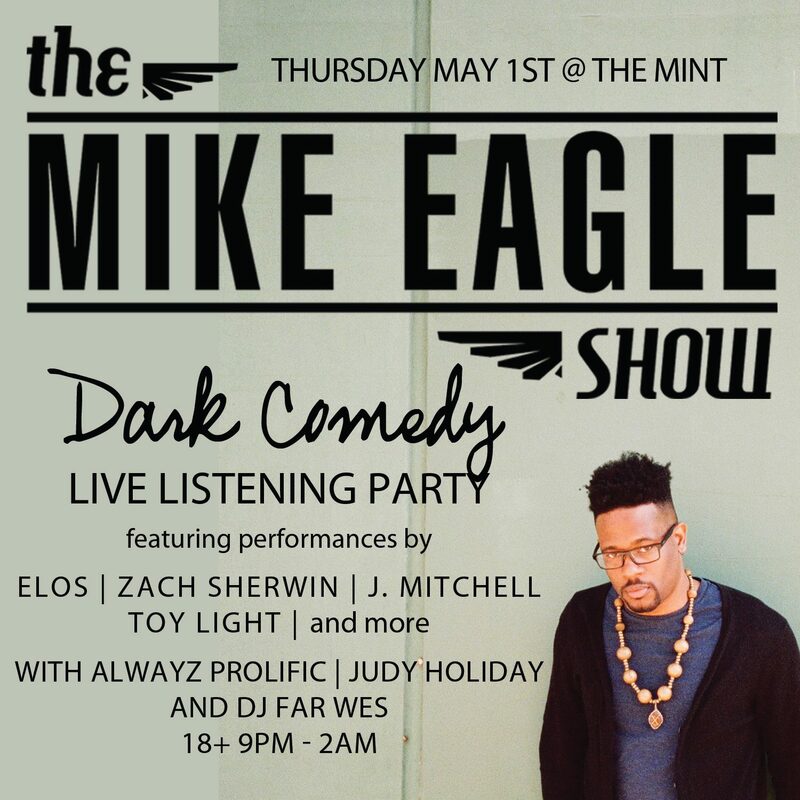 All you have to do is be in the Los Angeles area on May 1st and you can go see The Mike Eagle Show live at The Mint! 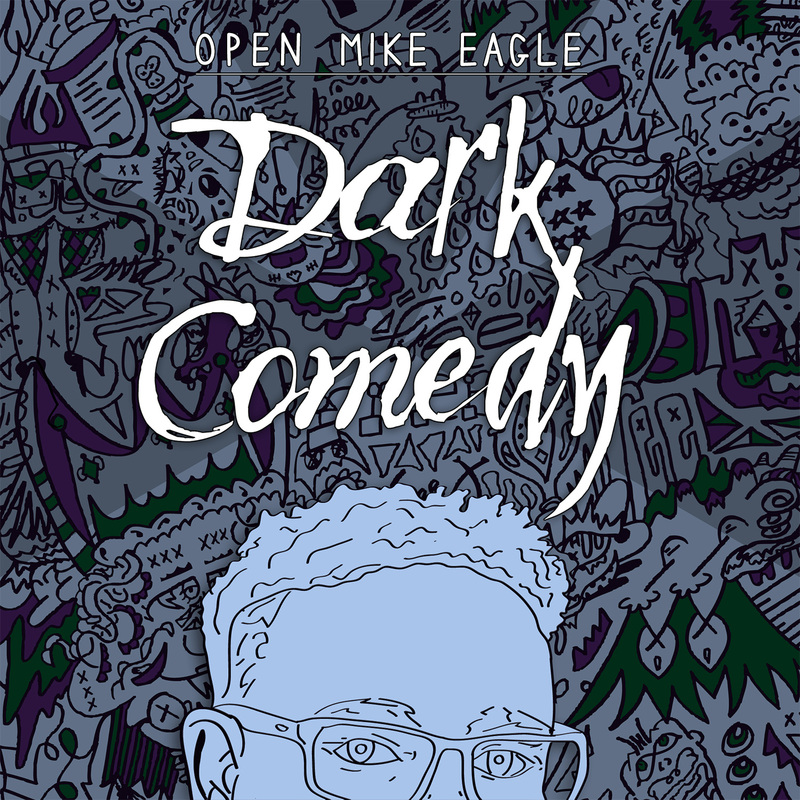 Yes, that’s right, The Mike Eagle Show is returning, and this time it’s a “Dark Comedy Live Listening Party.” Mike is going to be performing songs from Dark Comedy, many of them live for the first time! Mike has his own show. This is Mike’s show. And you’re invited! I won’t be able to be there (’cause it’s in L.A.), BUT MAYBE YOU CAN BE!? 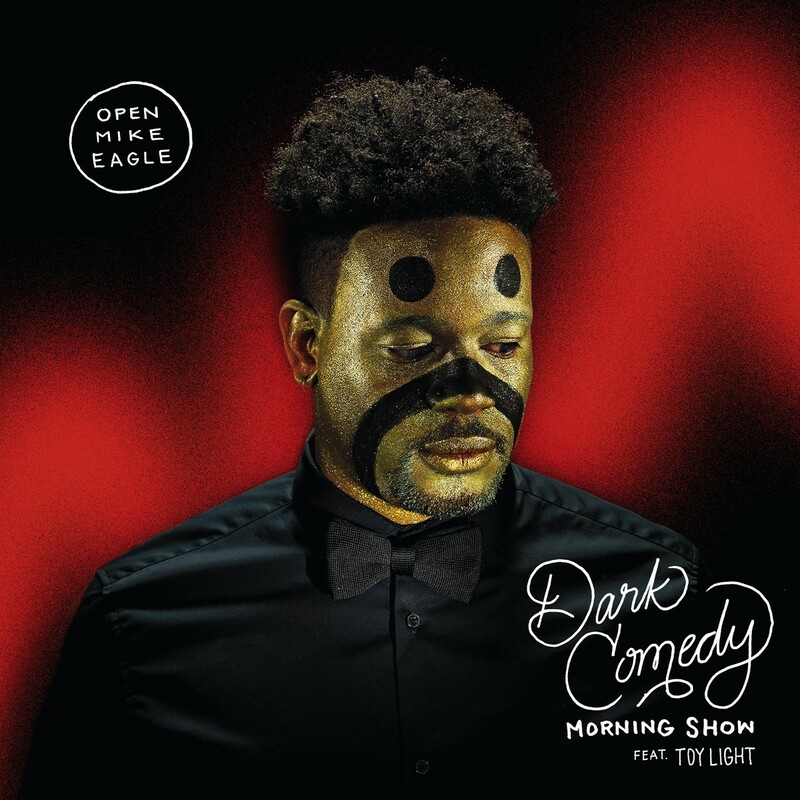 Tags: Dark Comedy, Los Angeles, Open Mike Eagle, The Mike Eagle Show, The Mint. I Don’t Know Who Amy Bockelman Is, but I’ll Be There Anyway! She also apparently has her own mini music fest: Bockelfest. I gather from inference that it is really just a fancy birthday party, but nonetheless she manages to gather some awexome bands in an awexome venue and have a rockin’ (and public-invited) good time. The Five Finger Discount on one foot each! Since two of these bands are two of our very-favorite bands in existence right now (and I gather that the other one is some sort of ad hoc band created just for this event), you’d best believe that Carrie & I will be there! Perhaps we will even meet and befriend this Amy Bockelman person. SO CAN YOU! Tags: Bockelfest, Julia Massey, Seattle, Sunset Tavern, The Jesus Rehab.